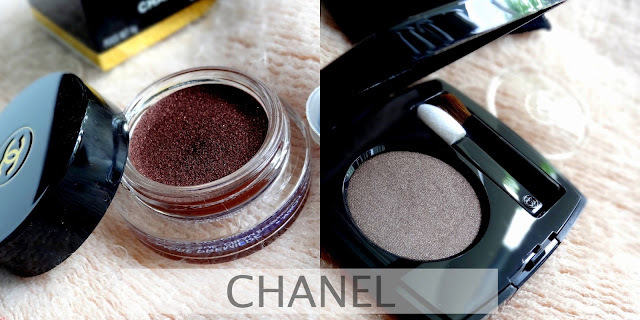 The Ombre Premiere Longwear Powder ($30; chanel.com) and Cream Eyeshadows ($36; chanel.com) are both new from Chanel. They are longwear, creamy shadows in powder and cream textures. Talpa is a powder, a very gorgeous grey taupe with a subtle metallic finish. It reminds of MAC’s Satin Taupe, only lighter and more greyed. Pourpre Profond is a reddish brown with lots of fine shimmer in a creamy base. I found Talpa’s formula to be a tad more pigmented than Pourpre Profond. Talpa also had a little bit of fall out when compared to Pourpre Profond, which is a true cream, but dries to a powdery, yet satin finish. The sparkle/shimmer doesn't really show up, but the finish has a nice sheen to it. While I cannot say these are the most pigmented eyeshadows I’ve tried, the pigmentation is good enough to show up true to how it looks in the pan. Pourpre Profond did sheer out quite a bit after blending, but it was also easy to layer on. I expected the texture of the creams to be similar to the Chantecaille Mermaid Eye Colors, but it felt a little more stiff, yet easy to work with. Both these shadows come along with small applicators and I prefer the one that comes with the cream formula since it is an actual flat shader brush that can be used in a pinch to apply color. The new packaging with the gold Chanel logo is really nice and I much prefer this over the old one. Overall, nice shadows, very soft textures with little fallout from the powder, but I’d personally check out the shades at a counter before buying more.